The members of the Disabled Drivers Association of Ireland are exclusively people with disabilities working for people with disabilities. The members are an important source for the generation of new initiatives. Awareness of needs or services that exist is often prompted by individual members, or by a combination of individual contributions by letter, telephone, or by email. Each year, the membership nominates and elects some of their number to the Board of the Association. A third of the places on the Board are available for election each year. An active Board is vital in generating new initiatives and in making choices about the policies and plans the Association should pursue. Successive boards and individual board members have been central in ensuring that the Association’s activities are sustainable and delivered competently. 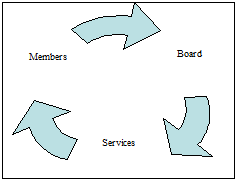 The above diagram express the inter-relationship between the input of the members, the direction of the board and the delivery of services to members and indeed the wider constituency of persons with disabilities. It is as a result of their efforts and the competence of previous general secretaries that the association is in such a healthy position today. Over time, as needs have changed, the Association has evolved in order to meet those needs not being met by mainstream services in the State or private sector. Engaging people with disabilities to act for themselves through the Association has been key. Each year members are offered the opportunity to go forward for at least two board positions. Through the individuals on its Board of Directors the association has sustained itself over forty years. Hopefully this will continue in the early decades of this new Millennium and beyond, as people with disabilities are engaged to act on issues relevant to their needs and requirements. 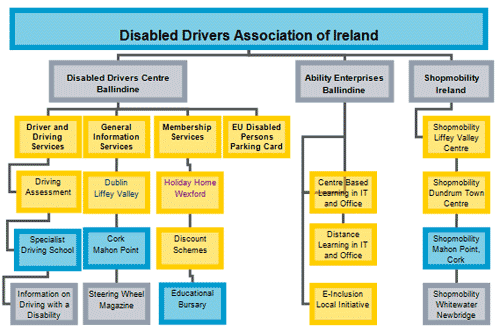 The Disabled Drivers Association delivers its services to members and to persons with disabilities generally through the Association itself and its two subsidiary companies, Ability Enterprises and Shopmobility Ireland. Ability Enterprises (founded in 1980) provides a range of training programmes, including work experience, in the areas of computer and office skills. All vocational courses are funded through FAS. All give FETAC or City & Guilds of London certification on successful completion. The courses are designed whether centre based or delivered through distance learning to enable people with physical and sensory disability to obtain skills in office working, site based or remote. Shopmobility is a scheme which lends manual wheelchairs, powered wheelchairs and powered scooters to members of the public with limited mobility to shop and to visit leisure and commercial facilities within a town, city or shopping centre. Over five years ago the Disabled Drivers Association of Ireland established the Shopmobility Scheme in Ireland to improve access to shopping to people with limited mobility. Since that first venture five years ago, Shopmobility has expanded to make Mahon Point Centre, Cork, Dundrum Town Centre, Dublin and Whitewater Shopping Centre, Newbridge friendlier places for people with reduced mobility. In Ireland, mostly for legal reasons the Shopmobility service is confined to shopping centres only. When And Where Can I Use?